Our Lord’s precious shoulder that carries the weight not just of our sins, but of the entire world in love. How strong He is. Last night I was in a lot of physical pain. I have osteoarthritis along with degenerative disks in my back and neck. Add a pinched nerve and well, it’s just painful at times to do basic things. As I prayed last night, I focused on the our Lord’s painful shoulder wound. How could I not join my suffering with His when His is the only suffering there truly is. I offered it up to Him. When I awoke this morning, I had no pain what so ever. I hadn’t taken any medication before heading to bed. My bed is not what you would call comfortable in any way. I was full of joy and my husband even asked me what I was so happy about. HA! All I could say was, God is Wonderful and He just does that. The pain I have is much less intense today, especially when I focus on Him and the weight His precious shoulder continues to carry today. 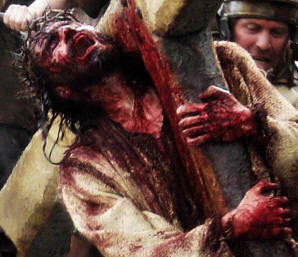 When I feel the physical pain, I am reminded of the mental anguish and physical pain my sins have caused Him. I never want to be the cause of that pain to anyone ever again. One Our Father and three Hail Marys following the above paryer.